This is a study of the structure and composition of the official learning current in medieval Arabic culture. This comprises natural sciences both exoteric and esoteric (medicine, alchemy, astrology and others), traditional and religious sciences (such as theology, exegesis and grammar), philosophical sciences such as metaphysics and ethics, in addition to technical disciplines like political theory and medicine, and other fields of intellectual endeavour. 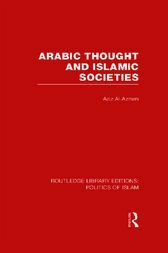 The book identifies and develops a number of conceptual elements common to the various areas of official Arabic scientific discourse, and shows how these elements integrate these disparate sciences into an historical epistemic unity. The specific profile of each of these different sciences is described, in terms of its conceptual content, but especially with reference to its historical circumstances. These are seen to be embodied in a number of institutional supports, both intellectual and social: paradigms, schools of thought, institutions of learning, pedagogic techniques, and a body of professionals, all of which combine to form definite, albeit ever renewed, traditions of learning. Finally, an attempt is made to relate Arabic scientific knowledge in the Middle Ages to patterns of scientific and political authority.